Moloaa Beach was another new discovery for me on my photo hiking tour of the east and north sides of the island of Kauai, HI with Kauai Photo Tours. I shot quite a few images here with my Nikon D-7100 and Tamron 10-24 and 18-270mm lenses, but it’s this image from my Lumia Icon smartphone that I like the best. Possibly because it’s native aspect ratio lends itself to landscapes such as this. We were getting ready to leave, and I pulled my phone out and made this image using the automatic setting as I wanted to send one of “those” emails. You know what I mean. One of “those” emails or messages we tend to do from time to time when we want to share something… and perhaps make someone a little jealous… It’s a sign of the times – vanity made easier by technology! In this case though, I wanted to share it with Mrs Frog who was enjoying her time at a different beach. My next favorite images from this location were made with the 10-24mm zoom. It’s just time and well, time that are keeping them from being posted at the moment. I’ve never done scenics on a beach with a 10-24 before, and I have to admit that I really enjoyed it. I am not getting paid for this – but I do have to say that I love my Tamron 10-24mm lens. It’s not a Nik**, and no ultrawide zoom is perfect, and for what the Tamron costs compared to the Nik**, you can either save a lot of money or use that money to put more toys in your camera bag. But I digress… You’ll have to wait to seem more of that lens’ work. 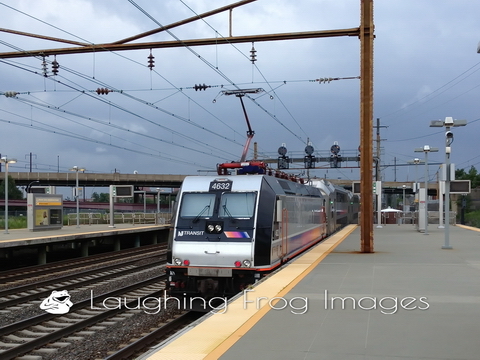 Technical details: This jpg is from a dng file. The original was at 0.00035 seconds, f2.4 at ISO 64. The camera is also capable of full manual settings, shutter priority and aperture priority, any one of which could have improved upon the original just a bit – but not bad from a phone camera at all! I tweaked the image just a bit in Perfect Photo Suite 9 – adding a slight skylight filter effect as well as a slight color enhancement. Moloaa Beach on the Hawaiian Island of Kauai. 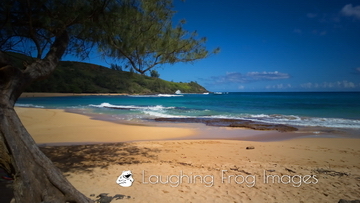 This image of Moloaa Beach is in the Coastal and Beach Scenes Gallery on Laughing Frog Images. Puukumu Stream meets the Pacific Ocean is one of my favorite images. It has a bit of an unlikely story behind it. So, our group is hiking down to the mouth of Puukumu Stream. Puukumu Stream runs north from the mountains of Kauai between Kahiliwai and Kilauea carrying rainwater to the Pacific Ocean. My gear is in my bag. We’ve crossed the stream and are heading north northeast to a small waterfall where the stream empties into the ocean. And the group is moving. And my gear is in my bag. And the group is moving. I look to the left and think “hey, that’s a great shot…” And my Icon is in my pocket. So, I stop briefly, pull out the Icon and snap a few in automatic mode, and then keep moving. Puukumu Stream meets the Pacific Ocean on the north side of Kauai, Hi. I thought it might have been a good grab shot. And the more I looked at it later in the day, the more I realized that it wasn’t just a good grab shot, but that it was in fact a great shot! This image was taken in DNG format with a Nokia Icon in Auto mode, ISO 64, 1/1500 second. Minor post-processing took place in Perfect Photo Suite 9. 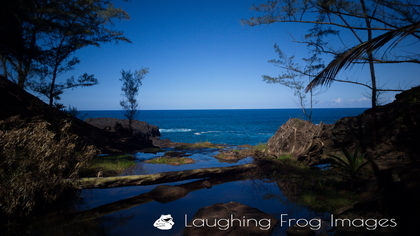 Puukumu Stream meets the Pacific Ocean can be found in the coastal and beach scenes gallery on Laughing Frog Images. This image would be no ka ‘oi (“the best” in Hawaiian) as a metal print or on metallic paper in 1 high x 2 wide format (10″x20″, 12″x24″). One of the benefits of today’s smartphones is that it’s easy to create an image as you’re walking along almost anywhere, like, for example, an airport. As proof, I offer you Symmetry at Sky Harbor. Out came the Lumia Icon and I snapped a few pictures. However, things just weren’t quite right in the Lumia’s original 16×9 (16 pixels wide for every 9 pixels high). I had symmetry, but it wasn’t right. 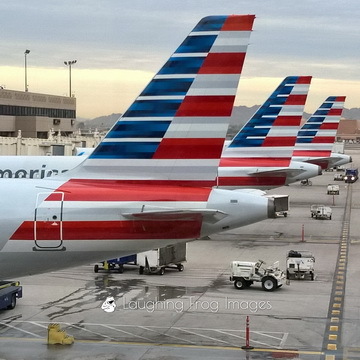 When I got to my next gate, I opened the image in my Picture Perfect app and began to create the symmetry I wanted. In this case, symmetry (at least to me) meant that the image needed symmetry as well. That meant a 1:1 (square) crop. So, that meant a little finger dragging to position the crop box and a simple tap to finish the image. I left the colors as the camera captured them. The muted pastels of the building and the sky offer a stark contrast to the metallic-like reds and blues on the tails. If you look closely, you’ll also see another element of symmetry – the auxiliary power units that appear just below the tail of every aircraft. It’s all in the details, which in some case rely upon how long you look at an image to find them. This may never sell as the cropped image is too small for much more than a coffee cup, and it may never win any awards – but I like this image, and that’s part of what it’s all about. It may also give you some ideas the next time you see symmetry, or the potential for it, in your travels – airport or otherwise. 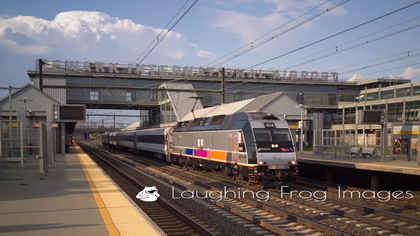 You can see this image in the planes gallery on Laughing Frog Images. Ever need every last drop? That morning cup of coffee is a ritual for millions the world over. Ever need every last drop? I was organizing images tonight and came across this one of our dearly departed Hunter. He liked a drop or two of iced coffee every now and then, and this day in November 2013 was one of those days. There were a few drops left, and he was determine that they were to be his. 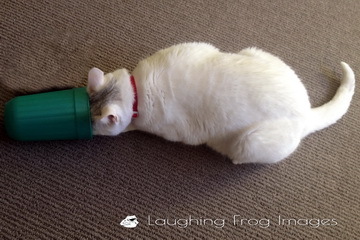 Never mind the fact that his head wouldn’t fit in the glass – he was going to get his due! Things came to a bit of a halt tonight as I paused to smile and remember him. For those of you who didn’t get to read about him when he passed, he was a gentle giant and a kind soul. Some &^$% people left him in front of a pet store in a crate on a cold February morning in 2012. We me him not long thereafter, as it seems that adopting cute kittens is far more prevalent than adopting a six year old. He was a project – building trust and getting him to understand that we were here to serve (cat owners, you know what I’m talking about…). Every time I see one of those “Who Saved Who?” bumper stickers, I can’t help but think of Hunter. Take pictures of your family. Take pictures of your friends. Take pictures of your pets. Take pictures of things that make you smile and things you want to remember. These days it’s pretty cheap and pretty easy to make a memory – there are few excuses not to make a memory. And when you stumble across random images when you aren’t expecting to, they bring a pause and a smile to the insanity and craziness that seems to be everywhere in life today. 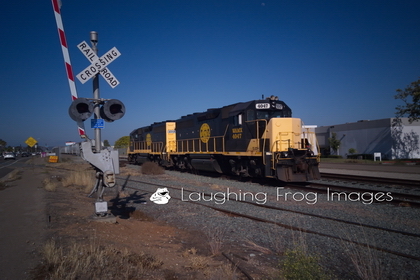 The Pacific Sun Railroad is a WATCO shortline that was established to take over local freight traffic from the BNSF on their former ATSF Escondido Subdivision and Miramar Branch. Seems like it’s the stuff that the BNSF didn’t want to be bothered with. As near as I can figure, the pictures in the Pacific Sun Railroad Gallery on Laughing Frog Images represent half of the railroad’s locomotives. From what I’ve been able to find on the web, these are said to be former Western Pacific GP40s that have been upgraded to -3 standards. These workhorses are somewhere between 43 and 49 years old. They’re working for at least their third owner – the Western Pacific was merged into the Union Pacific over 30 years ago. It’s almost hard to believe that the 40-series Geeps have been around that long! That means I’m…. never mind. They’ve reportedly got two other units – said to be former Seaboard Air Line GP35s working for at least their fifth owner. I’ve only seen these units in the yard at Stuart Mesa. I’ve seen the GP40s working at night several times, and most often parked behind a fence at a transloading facility along Miramar Road. This was the first time I’ve seen them in daylight and not behind the fence, so naturally that called for their portrait! It was late in the day in nice light – the deep blues were starting to set into the sky. Once again, these were taken with my Microsoft/Nokia Icon. 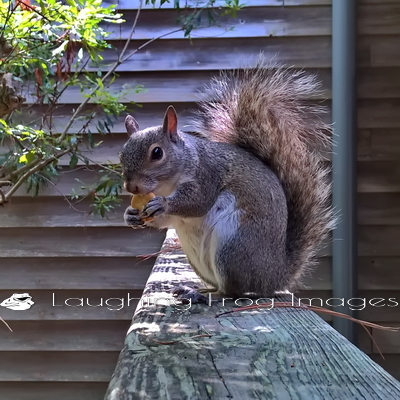 This is a .jpg image made from the original .dng file. Now, to get the GP35s…! Here’s a little “how to”post. 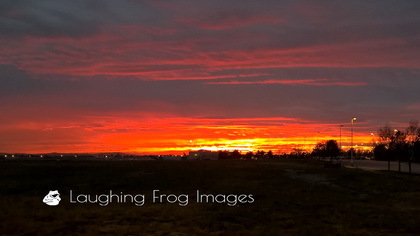 I was at Ontario (CA) International Airport at sunset recently, and saw the sunset, and you can guess what happened next. Out came my Lumia Icon, and I made a few images. Let’s take a look at them, and talk about how you can make great smartphone sunset images. Both images were shot on “auto” and are straight from the camera. Details of the above image: ISO 80, f2.4, 1/40 second. Details of the above image: ISO 64, f2.4, 1/12 second. So – how did I get the “ooh, aah” first image and get a “so-so” second image? Many (most) smartphones allow you to select a focus area by selecting the area you want the camera to focus on by tapping the screen with your finger. This also controls where the camera meters (measures light)! Proper metering is the trick to great smartphone sunset images. In the first image, I selected the brightest area of the sunset as the focus and metering point. As a result, the camera thought everything was really bright and reacted accordingly – this caused the camera to let in less light. This made most of the image darker, and allowed the reflected color in the clouds to appear in the image. In the second image, I let the camera decide everything. The result is “blah”, at least to me. The images are shown in the order they were taken. There are 90 seconds between the two – I was taking images and metering off of different points. The first image is the best of the bunch. Next time you see a great sunset, try this! It’s a way to control your smartphone camera for sunsets even if there are no control options. Remember, film is cheap these days. Shoot often, and have fun. This concludes your smartphone sunset lesson. As always, shares and likes are appreciated, and don’t forget to visit Laughing Frog Images for your decorating and gifting needs (and your own indulgences).